One of the ideas on my Bucket List that you were VERY excited about was the monthly nail contest. Each month will have a different theme, and you will be able to vote on who the winner should be! I will also pick 3 Honourable Mentions. This month, the theme is the New 31 Day Challenge. 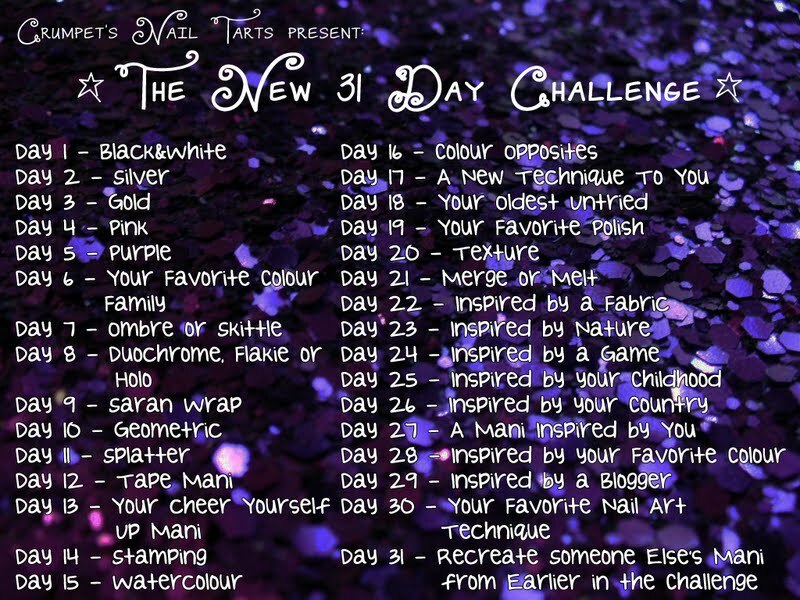 You can pick ANY day from the Challenge, and do a mani. There's lots of variety in there, so it should be suitable for almost everyone. * there is no prize lol, it's just for fun. * to submit your entry you will need a photo and you will need to click on ADD YOUR LINK at the bottom of this post. Enter www.the-crumpet.com as the url if you do not have a blog of your own, and then enter your own details. When it clicks through to the next screen, you then need to UPLOAD PHOTO FROM COMPUTER. * the winner will be based on votes received. You can vote via this page. Votes and submissions will be accepted until 31st January ends in the UK - remember, the earlier you post, the more chance you have to receive votes! So, what are you waiting for - good luck ! !